Louisville, KY (May 3, 2012) – Candidates in Kentucky’s Fourth Congressional District participated in a Kentucky Farm Bureau (KFB) “Measure the Candidates” meeting on Wednesday night at the Boone County Extension Office. David Chappell of Owen County served as moderator for Kentucky Farm Bureau’s “Measure the Candidates” forum for the state’s 4th Congressional District at the Boone County Extension Office on Wednesday, May 2. Candidates from left to right are: Marc Carey (R), Bill Adkins (D), Alecia Webb-Edgington (R), Walt Schumm (R), Gary Moore (R) and Thomas Massie (R). The event gavecountyFarmBureau leaders from that district an opportunity to learn the candidates’ positions on some of the organization’s most pressing national issues. 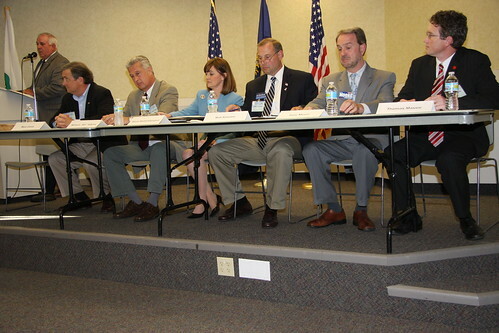 Six of the nine candidates participated. Following opening remarks, each candidate responded to questions relative to KFB’s policy on the federal farm bill, environmental regulations for agriculture, taxes and farm labor. The forum concluded with closing statements from the participants, Republicans Marc Carey, Thomas Massie, Gary Moore, Walter Schumm and Alecia Webb-Edgington, plus Democrat Bill Adkins. Bill Adkins: Adkins, an attorney in Williamstown, said he was pursuing the office because “I believe we have great problems and need to turn this nation around.” He pointed to a “terrible” economy and vowed to take a “positive approach” to addressing issues. On the KFB issues, Adkins said he supports modifying the estate tax structure to remove implications for farms, favors major reforms to the farm labor programs to streamline the process for farmers and agrees that the federal farm program should include some form of economic safety net. He vowed to strongly support conservation programs and to reduce government regulations on farms and other businesses. Eliminating the federal debt would a top priority, he said. “We can restore a great economy and do it in a real world sense,” he said in his closing remarks. Alecia Webb-Edgington: The state representative fromFortWright (63rd District) quickly stated “I’m not a career politician” and noted a background as a state trooper and the Homeland Security Director forKentucky. She informed the audience of degrees fromWesternKentuckyUniversity andEasternKentuckyUniversity. Rep. Webb-Edgington also vowed to pursue tougher immigration law enforcement. He said he would work to roll back government regulations on businesses and to repeal estate taxes. He said he favored a flat tax. With the farm bill, Massie said budget cuts are necessary “but we need to protect small farmers.” He said farm program payments to large farms should be eliminated. Gary Moore: The Boone County Judge-Executive frequently mentioned his upbringing on aPendletonCounty farm and family ties to Farm Bureau. He told the audience that during his term as Judge-Executive, Boone County has seen tremendous growth in population and its economy but that “we’ve been fair and balanced in protecting agriculture” from urban sprawl. He voiced support for killing the estate tax and preserving the Bush tax cuts. He advocated a flat tax, a balanced budget amendment, major reforms to the H-2A farm labor program, tougher immigration laws and repealing Obamacare. Schumm said he opposes the estate tax, supports the Bush tax cuts plus a 10 percent cap on capital gains taxes. He said Congress should re-authorize the farm bill to retain income support provisions because “crop insurance hasn’t worked well.” He vowed to defend farmers in the regulatory arena.